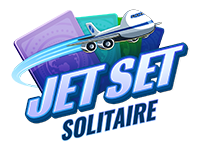 Pack your bags and take flight in this solitaire-powered world tour. Pick cards that are one number higher or lower than the Tour Card. 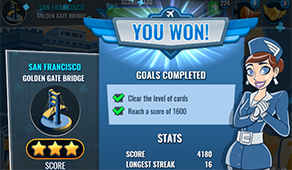 Discard all the cards and achieve all objectives to complete the level. Finish each level and earn enough stars to unlock the final attraction. 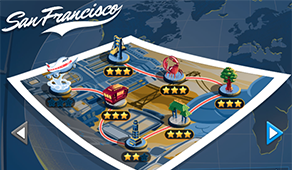 Find more levels and adventures waiting at your next destination! Pack your bags for a whirlwind journey to the hottest vacation spots. 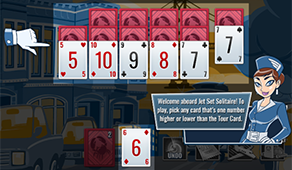 Jet Set Solitaire takes you around the world with challenging levels and fun tri-peaks gameplay. 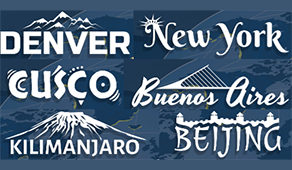 We want you to make the most of your travels, so be sure to follow our in-flight guide! Aces are high and low. You can match them with a King or a 2. Use them to loop back around when you count all the way down, or reach the top. To get a higher score, try to create streaks. This happens when you discard lots of cards in a row. As your streak reaches certain milestones, the amount of points gained from each new discard goes up. If your current Tour Card provides no options, you can pull a card from the draw pile. Be careful not to run out! Some levels have objectives beyond just removing all the cards. Pay close attention so you don’t miss the goal. Try to remove cards strategically. If you have multiple options, think ahead. One path might allow for a longer streak. It’s also smart to remove any cards that are covering up other cards early. The sooner you know what you’re up against, the better! If you run into obstacles, power-ups can help you clear a path forward. The Undo Power-Up lets you flashback to before your last move. It comes in especially handy if you miss an obvious match. Sometimes the best play is behind you. The First Class Power-Up lets you replace your Tour Card with any card on the level that is face-up and uncovered by another card. First class has its perks! The Jet Wash Power-Up blasts away all uncovered cards on the board in the wake of a supersonic flyby. The X-Ray Power-Up flips all face-down cards, letting you plot your course knowing every card on the level. You can also activate boosters to make your travels more rewarding. Boosters can only be used once, and most last from activation until the end of the level, win or lose. The Assistance Booster shows you all cards on the level that are one number higher or lower than your Tour Card. The Tailwind Booster makes getting streaks a breeze. Each discard counts as two cards, allowing you to take your streak to new heights quicker. The Upgrade Booster makes it easier to keep a streak going. Instead of ending instantly with one wrong move, you now get up to three moves before the streak ends. Unlike other Boosters, this one ends after the third streak-breaking move. If you reach the end of the Draw Pile with cards still on the level, you can also purchase an Extra Cards Pack to get five more cards. As you travel around each destination, you’re sure to encounter a few obstacles. Don’t worry – we’ll help you make short work of them! Turbulence Cards count down to certain doom. Make sure to discard them before the counter on them reaches zero! Passports must be filled by Stamp Cards before they fold up and reveal any cards trapped below. Seat Belts make cards extra tricky to discard – requiring multiple Tour Cards. First, you need to take out the Seat Belt, then get the card it was covering on another pass. Gates can only be removed by finding and removing the card with the Boarding Pass icon on it. When faced with a choice between discarding multiple cards with the same number, go for any that are covering other cards first. You might uncover the card you need to start or keep a streak going! Always double check before drawing a new Tour Card. It’s very easy to miss a possible discard. Save your Undo Power-Ups for when you really need them! Sometimes it pays to leave a card that you could discard, especially if there’s a chance it might help you make a streak later. If you have cards on the level that are locked behind a Gate or Passport, prioritize getting those out of the way as quickly as you can. Some events in the game can’t be undone, so be extra sure about the moves you make!